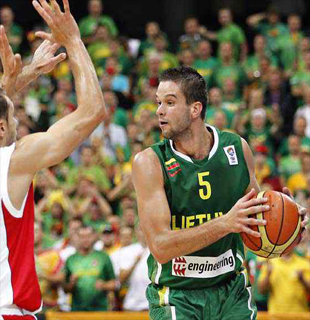 In the clash of two powerhouse and undefeated teams, host Lithuania leaned on their balance attack to score a huge 75-68 win over Turkey in Day Three of the ongoing EuroBasket Men 2011 in Lithuania. Former NBA player Darius Songaila led Lithuania’s balance attack as he finished with 12 points and five rebounds, while Simas Jasaitis and Rimantas Kaukenas added 11 points each with the former adding five rebounds. Sarunas Jasikevicius didn’t score that much, finishing with just seven markers, but the superstar dished out seven assists, while Mantas Kalnietis and Martynas Pocius added nine points each for Lithuania, who started to control the game in the third period. Lithuania had a strong third period, but the game was still close down the stretch. Emir Preldzic had a chance to tie the game with 1:18 left in the game, but he split his free throws and Lithuania took advantage to pull away in the closing minutes of the bench to the delight of the jam-packed Panevezys Arena. Ersan Ilyasova had his best game of the tournament, racking up 20 points, while Omer Asik added 11 points and 13 rebounds, but it was not enough as Turkey, the silver-medalist in last year’s World Basketball Championship, succumbed to last year’s Bronze medalist in the same tournament. Both teams will take a rest on Saturday before resuming journey on Sunday with Turkey taking on Poland, while Lithuania goes up against Spain, who is still undefeated in the tournament.